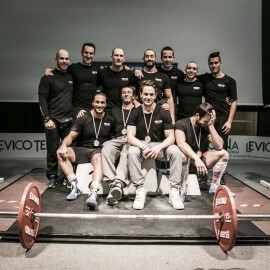 By Emanuele Caratelli, MSc, ISCI-Sport Strength Coach and ISCI lecturer, is one of the powerlifting coaches of the International Strength & Conditioning Institute powerlifting team.Our team won the raw deadlift National title for both male and female categories for two years in a row (2014 and 2015).Our athletes won a total of 13 medals and set 5 national records in the process. 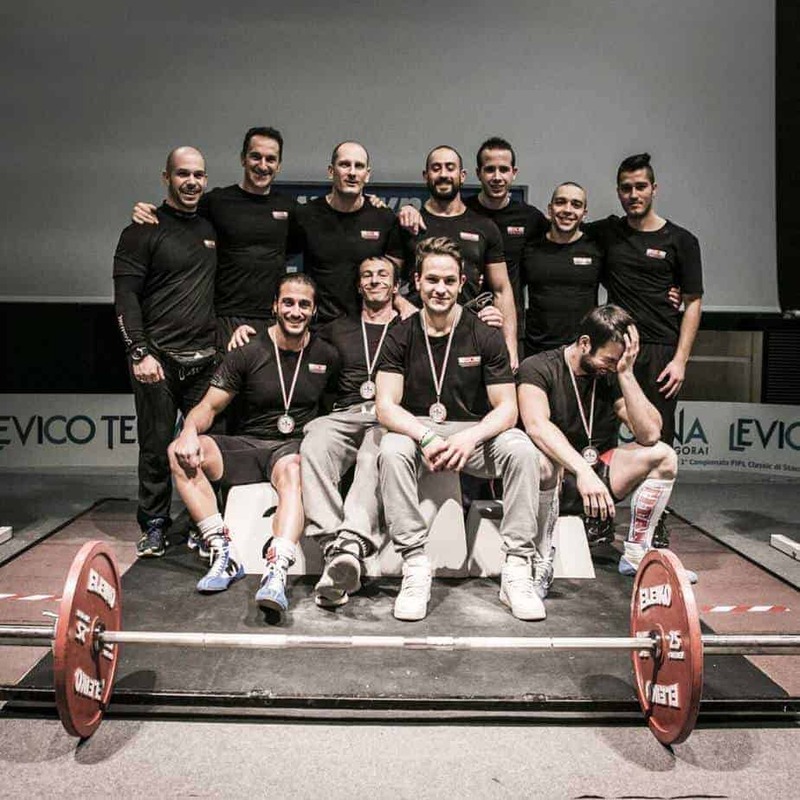 Among our athletes, most of the medalists are trained by Emanuele, who takes a long-term approach for the deadlift specialization. You can find a summary of the results of our powerlifters at the end of the article. 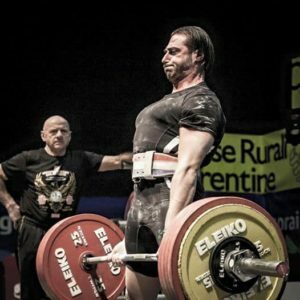 In this article I will show you a deadlift program recommended to those lifters who are not beginner any more and want to improve their deadlift while training four days a week. Systemic stress is the residual fatigue encountered by all the physiological systems as a consequence of a training session. We all know that squatting for 6 sets of 3 repetitions at 80% of 1RM does not affect our body in the same way as deadlifting with the same loading parameters does. The day following a squat session we would probably feel neurally activated, certainly not tired and we could even do it again, if we wanted to. In the deadlift scenario, it would be very hard to repeat the same workout; it would require a great voluntary effort and the overall performance would be worse. All these differences are caused by the different systemic stress/burden. Now, let’s show a sample program designed according to the principles exposed above. I choose to show this one because it really follows my principles: I love long training cycles for the deadlift (this one spans over 22 weeks), and I increase intensity very gradually (here we start from 57%). This program has been used by two members of our powerlifting team. 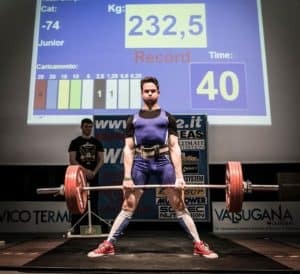 It was the first time they followed such a long periodization, and both have added many kilograms to their PR’s: the first one went from 155kg/343lbs to 195kg/431.4lbs (in the -66kg/146lbs weight class) and the second one from 205Kg/453lbs to 240Kg/531lbs (in the +120kg/265.4lbs). Both lifted raw (belt only). You surely noticed the weird percentages I used, such as 73%, 78%, 86%. 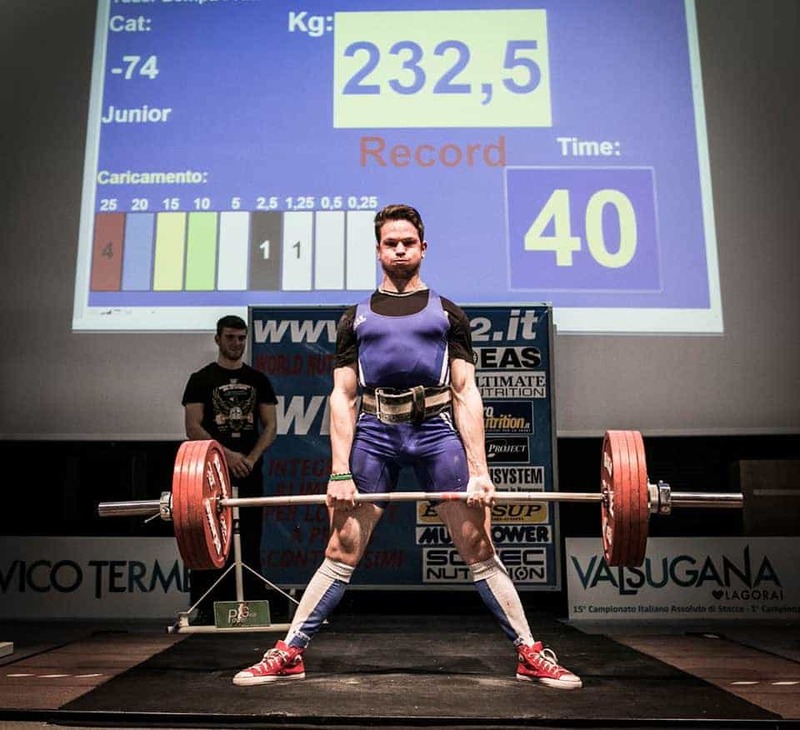 Usually, we increase by 5%, but not in this case, for this simple reason: this program was designed around a guy who wanted to attend a deadlift-only meet, and I only thought of his condition and how to improve it as much as possible in the 22 weeks leading us to the meet. I wrote the loads he could easily use in that moment (first week), then the deloading phase (week 21 and 22) and finally the weeks when I wanted him to reach the highest work load, first in volume (week 13/14) and then in intensity (19/20). After that, I just filled in the blanks, starting from the beginning, writing down for each week the sets, reps and kilograms to lift in order to reach our goal. The program eventually proved to be tremendously effective, so I retrospectively calculated the percentages (since I knew the starting 1RM) and used it as a general template for other people. As you can see, there are two column, with different percentages: one is calculated on the actual 1RM, the other one is based on the expected new 1RM. Let’s see now the structure: for the first 12 weeks, the program has a 2:1:1 structure, two week of volume, one week of intensity and one week of deload. As you can see, there are two weeks of high repetitions and a fair amount of volume, with a linear increase in intensity of 7%. In week 3, volume decrease by 63% and intensity increase by 10/15%. Week 4 is a regenerative one, with low volume and a 20% drop in intensity. Such a pattern will be used for two more macrocyles, with linear increments in volume for the first two weeks and in intensity in the third one. Percentages are increased in “volume weeks” (5 and 6), but they are still low, so we can work on proper form. That is why we use a number of repetitions (5’s) that may sound a bit inappropriate, but which is really useful, because it allows me to give feedback after each repetition, so that the athlete can correct himself and do the next repetitions with perfect form. Low intensity, as we said before, allows the athlete to listen to his own body and to correct himself. In this phase there’s a high number of sets, because we are teaching the motor pattern to our CNS, and this is possible only if we repeat many times the same pattern, just like when we are learning a poem by heart or using a new tool. The endless repetition of the same action, however, doesn’t lead to perfection, because there’s an optimal learning curve: if we repeat the stimulus too much, there’s no improvement, and cumulative fatigue actually corrupt the pattern we are trying to build. I’m not saying that I know the magic number of such a learning curve, but we know that the ability to absorb information (in this case, work capacity) can be trained too; this is the reason why volume constantly increases. low-intensity work can soften the athlete both psychologically and physically, but on the other hand, high-intensity work doesn’t leave room for technical improvement, so we just thought of this happy medium. We later empirically found that short periods of high volume followed by higher intensity phases were very well tolerated and effective. Structure 2:1:1. As you can see, during volume weeks we get very close to 70%, because we’ve been working for eight weeks, and training has created positive adaptations, making the athlete able to tolerate such voluminous work load. Now we introduce a variable: sets of 6 repetitions. So far we have been working with 5’s, and even one more repetition creates fatigue and makes technique work harder. During the intensity week we get closer to 80%, with doubles and singles, to prepare the athlete to the first milestone of this program, two weeks later. Intensity is slightly increased in deload week too, since we can expect that the 1RM is already higher. After all these weeks spent on technique work, with a bit of maintenance of rate code, we surely learned a better control of the load and we already increased our 1RM, but this is going to be the macrocycle I deem fundamental for the success of this program. I think every program should have a kind of “shock macrocycle”, a phase that create a systemic stress high enough to trigger a “flight or fight” response that takes our athlete to the next level of adaptation. This may seems to contradict what I wrote at the beginning, but it’s not the case, because we only use this shock once in 22 training weeks, after 12 weeks of preparation and 8 weeks out of the meet. The shock of this phase is a tremendous volume, because in the first week there are 20 sets in the first workout and 15 in the second, but they are only 3 repetitions, at slightly under 80%. We can safely presume that the first sets will be fairly easy; as cumulative fatigue sets in, it will be very challenging to keep proper form and good speed. Actively fighting to keep technique and speed against fatigue is an excellent training for the CNS. Total repetitions are 105 in first week and 92 in the second one, but we have done more earlier, with 100 and 120 in week 5 and 6. What makes these four workouts unique is the way they follow one another: the first one, with 20 sets, scares and defies the athlete, which will be exhausted by the end. The second one is even harder because of the fatigue from the previous one, but since the load is 5/10kg lighter and there are 5 less sets, the athlete will be more confident. The third workout has even lower intensity and half the sets, to give a break both physically and mentally, but we add a repetition. The fourth workout is probably the most taxing of the whole program, since it comes after a high-volume week and has the athlete doing 15 sets of 4 repetitions at 80%. After this workout the athlete will feel exhausted because of the last two weeks, and he will still feel the same during the following week , even if it is only a deload week with far less volume (66% less). The first workout is light, the second has a higher intensity but with a low volume and a big buffer. In the fifth macrocycle we hope our subject has already acquired a consistent motor pattern, since he will be almost bored by the repetitiveness of the movement he has been doing. He will also have a very high systemic stress because of the former macrocycle, despite the deload week. From now on, we will prime CNS recovery and try to restore an optimal hormonal balance to get a peak performance. This is the reason why daily volume will be far less, switching from 100 to 30 repetitions (66% less), but intensity will raise. After all the frustrating low-intensity, high-volume workouts, technique should be consistent enough to allow the subject to concentrate only on using all of his strength. Furthermore, high-intensity phases are the natural continuation of high-volume ones, and psychologically the subject is eager to test himself. Let’s get a closer look: in the first workout we get to 85% of 1RM, but for only two repetitions, because the athlete has not fully recovered after the shock macrocycle. We can assume that the deload week has only given the start to the regeneration which will lead to the activation of parasympathetic nervous system; it’s not unlikely that the athlete can feel two repetitions at 85% very hard. We will explain him that is normal, because his body is still recovering. During the second workout we want the athlete to feel a lighter weight so we lower intensity, but we add a repetition. Our purpose is to prepare the first workout of second week, where we get to 95% of 1RM for singles; the second one is at 85% again, but for 3 repetitions. During the deload week, as usual, the first workout is a very easy one, to refresh technique, while the second get us closer to regular training loads. High performance is not expected in this macrocycle, because of cumulative fatigue, but proper form should be maintained. The sixth macrocycle is the last one, and the most important after the fourth; not only because it leads us to the competition, but also because we highly stimulate our athlete’s rate code. Volume remains low, while the athlete will only think to accelerate the barbell as much as possible. This will require a great effort, because with percentages from 85% to 95% of 1RM, it will be very difficult to see the barbell move fast. The reiteration of stimuli between 65% and 80% has been very high – almost boring – throughout the whole program, technique is now extremely consolidated, that is why in these last two weeks before the deload we require the athlete to just push as hard as he can. In this phase athletes are relieved because of the low volume and also because, finally, they are not constantly reminded to pay attention to small technical details. They feel free to just lift aggressively. Loads are high, 92% and 97% of the old 1RM, but our athlete will feel them a bit easier than during the previous macrocycle (the maximum volume one), exactly easier than week 17 (where he got to 95%). Since he will also lift loads close to his 1RM, he will build confidence and desire to get as soon as possible to the test/meet day, to see all the progress of such a long preparation. Last two weeks are a tapering, where we work with doubles at 86% (in the first) and triples at 78% (in the second). Usually I use doubles at 80% and triples at 70%, but in this case I prefer higher percentages because this is not the usual 8/12 week cycle, so 1RM should have dramatically increased; by the way, if we look at the second column (the one with % of expected 1RM), we’ll see that deload is very close to 80% and 70% (82 and 74, respectively). Tapering is one of the most important part of the program, after the shock macrocycle; the latter elicits strong adaptations and improvements, the former shows them. Just like the bride’s hair: the haircut is essential, but a good styling will show it at its best, and like a good hairdresser we have to know the “face” of our subject, for a fitting hair style. Someone may need some more volume and/or intensity, someone less, doubles at around 80% for two workouts in the first week, and triples at 70% for one workout in the second are a good starting point. I cannot give you the perfect tapering, since this is the most craftsman-like part of coaching, where there’s still something artistic and intuitive, since there are so many variables that only the coach who has been following the athlete for all the preparation is able to synthesize. One last consideration: this program seems doable only by powerlifters. This holds true only if the program is followed to the letter, but the logic behind it can be used to build any deadlift routine, as long as you respect the proportions between each phase. For instance, the shock macrocycle is essential, and it should be planned at around 3/5th of the program duration, whether it lasts 20 weeks or 10. The shock macrocycle can be built using volume as a stressor (just like in our case) or intensity, something like 5×5 at 85%. Then you put the last two weeks of tapering like we did, reducing volume even by 50%. These are the principles of this program, if you respect them you can build many other programs of different duration. ** A 15 year old volleyball player performing strength training once a week for the previous six months. A Physiological Review of American Football“International Workshop on Strength & Conditioning”, 24th-26th May 2012, Trivandrum (India): The Abstracts. How you adjust the assistance exercises in the macrocycles? How is it look like at Volume week, Intensity week and at the Deloding week?